"The Nightlife, While Not Continental, Is Lively"
Tamerlane's assault on the Arctic was so successful, he has set his sights on a bus trip from San Diego to Panama. This 10-day campaign will be fraught with humidity, ramshackled outhouses, beggars, and petty criminals. The trip via the Pan-American Highway ends at the little frontier town of Yaviza, just 30 miles from the Colombian border. For a plethora of reasons, both simple and complicated, a road does not connect the North and South American continents. 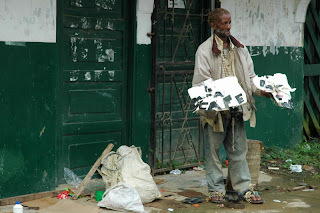 The Darien Gap between Panama and Colombia acts as a buffer. In Yaviza, don't forget to use your Club(tm). In the Gap are jaguars, Colombian rebels and paramilitaries in hiding (including the FARC, the ELN, and the AUC), drug traffickers, gun runners, common criminals, and tropical diseases. The U.S. State Department warns its citizens to not travel to Darien province due to the risk of murder, kidnapping, and violent crime. 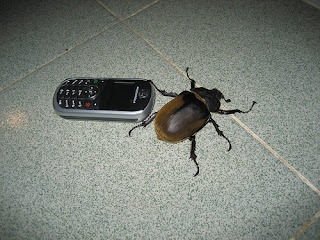 When the bug in your hotel room is bigger than your cell phone, chances are there is zero cell phone reception. 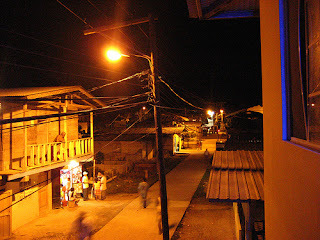 I will have to end my journey in Yaviza, a 1,600 strong frontier town abutting the Darien Gap. Here, according to Outside magazine, the weapon of choice is the broken bottle and the prostitutes are barefoot. 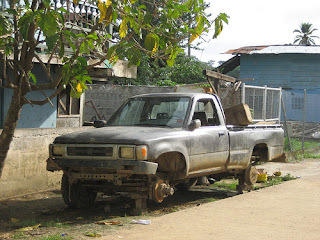 That former strongman Manuel Noriega was raised in Yaviza is not surprising. In a euphemism-filled advertisement for a hardwood farm (on sale for $1.2 million) near Yaviza, the seller states: "The nightlife [of Yaviza], while not continental, is lively." 'Nuf said.